Garmin .gdb MapSource files, are files designed to be used with Garmin GPS units to transfer routes, maps and information. .gpx eXchange is a light-weight XML data format for the interchange of GPS data (waypoints, routes, and tracks) between applications and Web services on the Internet. Most GPS software will be able to open these files. As trails change blaze colors and can be rerouted having a GPS unit is a great way to see exactly where you are along your hike. Whichever Garmin unit you have you will need the TOPO three CD set that will allow you to select maps and create routes and way points. Nearly all of the Garmin GPS units will transfer the route portion of the file and graphical Garmin GPS units will also transfer selected map(s). All hikes on this site contain a link to a Garmin MapSource file, and are being updated to include the universal .gpx eXchange files as well. Note: You need to have the TOPO CD's installed on your system to transfer the maps with the .gdb files. I personally use the Garmin GPSMap 76CSx. But here are many other Garmin units designed for every budget. 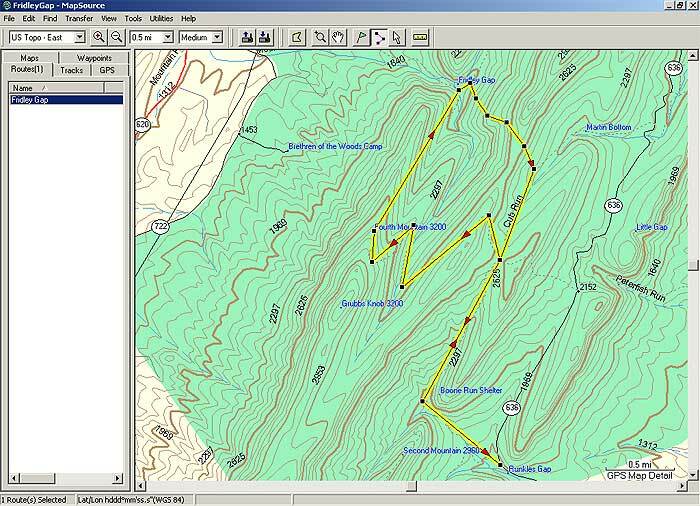 Below is an example of the MapSource software with TOPO installed and the Fridley Gap GWNF hike loaded.